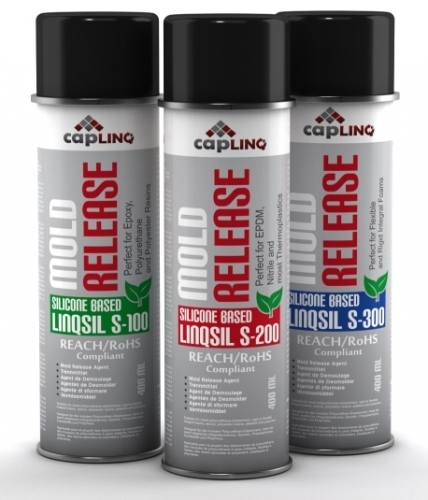 LinqSil™ Series mold release agents are high-performance, high operating temperature mold release agents designed to release epoxy, epoxy mold compounds, polyurethane, polyester resins, EPDM, nitrile, thermoplastics and flexible or rigid integral foams from their molds. LinqSil S-300™ is a versatile, high performance and high operating temperature stable, silicone-based mold release agent suitable for most flexible and rigid integral foams. For epoxy molding compounds, as well as liquid hot- and cold-curing epoxy-, polyurethane and polyester resins LinqSil S-100 is the best choice and for EPDM, Nitrile and thermoplastic molding, please refer to LinqSil S-200.